This may be a book about a frozen adventure in the coldest corner of planet Earth, but Keep On! The Story of Matthew Henson, Co-discoverer of the North Pole, is so much more. In fact, it is one of the most heart-warming stories I’ve read in a long time. 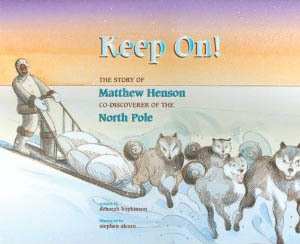 Written by Deborah Hopkinson and illustrated by Stephen Alcorn, Keep On! tracks the life, bravado and sense of adventure of daring African American explorer Matthew Henson, who was born in a humble cabin just one year after the Civil War ended. The book enlightens history-lovers on the truth about explorer Robert E. Peary’s Arctic adventure, and how if it hadn’t been for Matthew Henson’s skill, bravery and loyalty to Peary, the expedition that landed Peary in the history books might not have been a success. Ms. Hopkinson stimulates the reader’s imagination with her unique writing style, using Henson’s own words as text, then following them up with her own lively narrative, making for a very interesting read. I really enjoyed this book; it was especially satisfying for me as a lover of African American history to learn the truth about Henson, and to see his story so expertly and painstakingly illustrated. I usually pass along the books I review, but this one is going into my special collection. Don’t miss out. 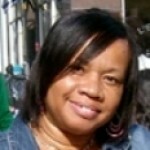 Get your own copy of this history lesson, African American biography, and old-fashioned good read, all rolled into one!